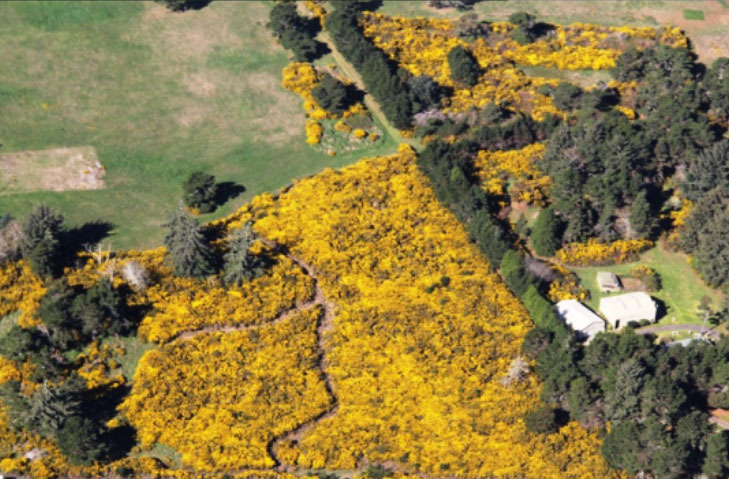 established in the project area and gorse is common to the south. 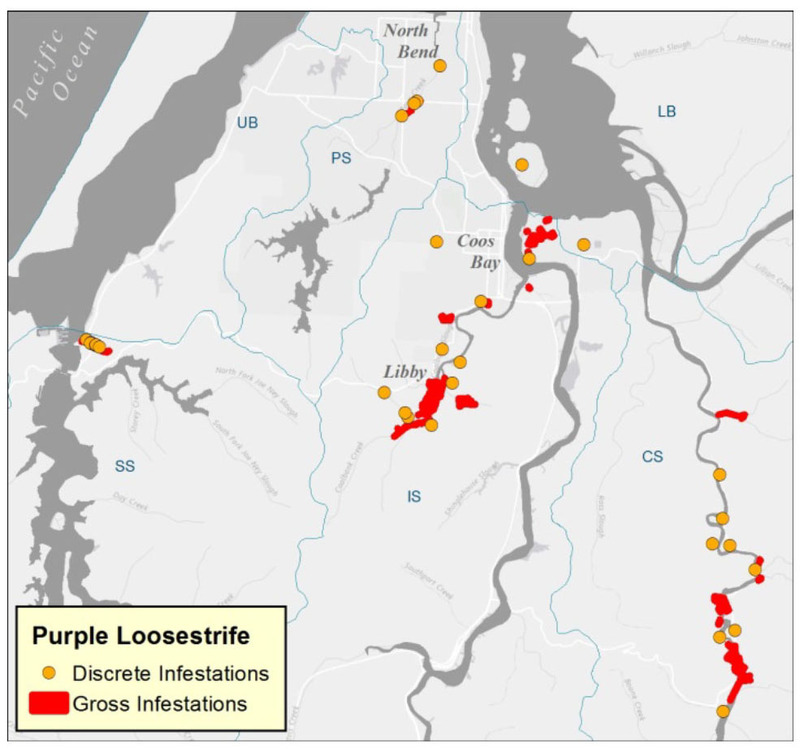 Locations of select non-native invasive plants established in the project area in isolated populations or species that are currently being targeted for removal or control actions. threat, pale yellow the lowest threat (see color code graphic). Table 1. Predicted non-native and invasive vegetation species threats. * Listed species are considered noxious weeds by the state of Oregon (Oregon Department of Agriculture). 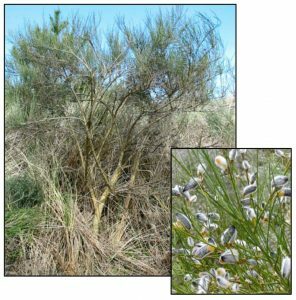 A-listed species: Economically threatening weed which occurs in small enough infestations to make eradication or containment possible; or is not known to occur in the state, but its presence in neighboring states make future occurrence in Oregon imminent. 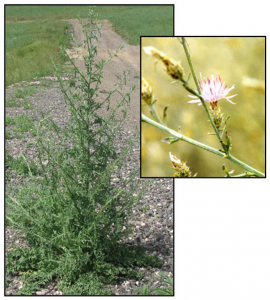 B-listed species: Economically threatening weed which is regionally abundant, but may have limited distribution in some counties; T-listed species: Weeds annually selected from A or B listed species as the focus of prevention and control by Oregon’s Noxious Weed Control Program. ** Weed distribution color key: Yellow: limited; Red: widespread; Green: historical; Gray: not known to be present. (ODA 2014a). 1) What’s happening? ; and 2) Background. populations within the project area. found across much or all of the project area. species included in this data summary. regional areas of the state (Zouhar 2005a). 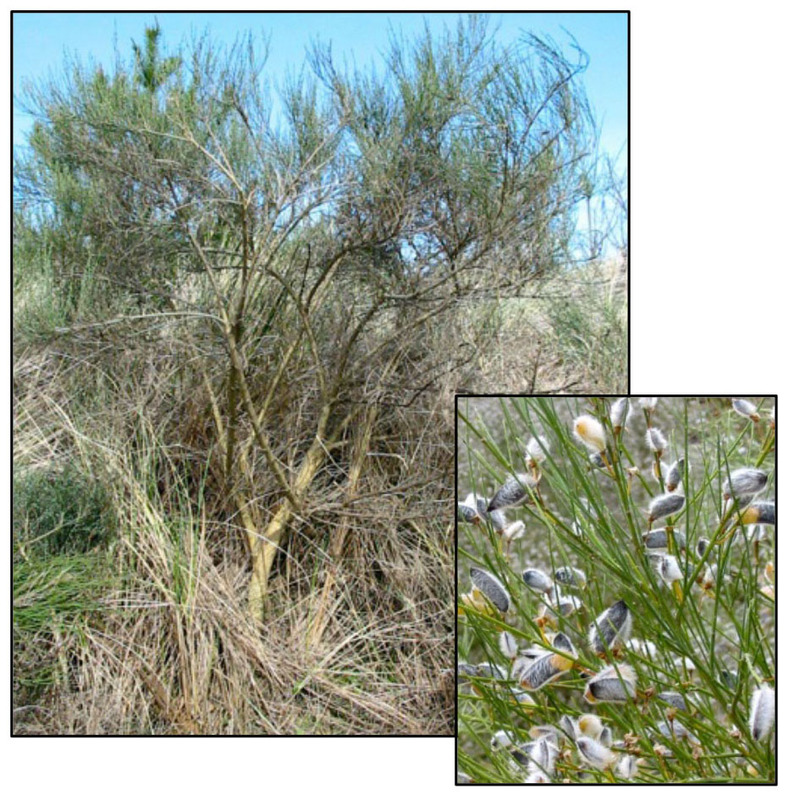 (Cytisus striatus) plant and close up of seed pods. reproductive potential (Figure 6)(Forney 2013). being actively managed or were just recently discovered. effective seed dispersal strategy (ODA 2014a). and 9)(EDDMapS 2014, ODA 2014a). 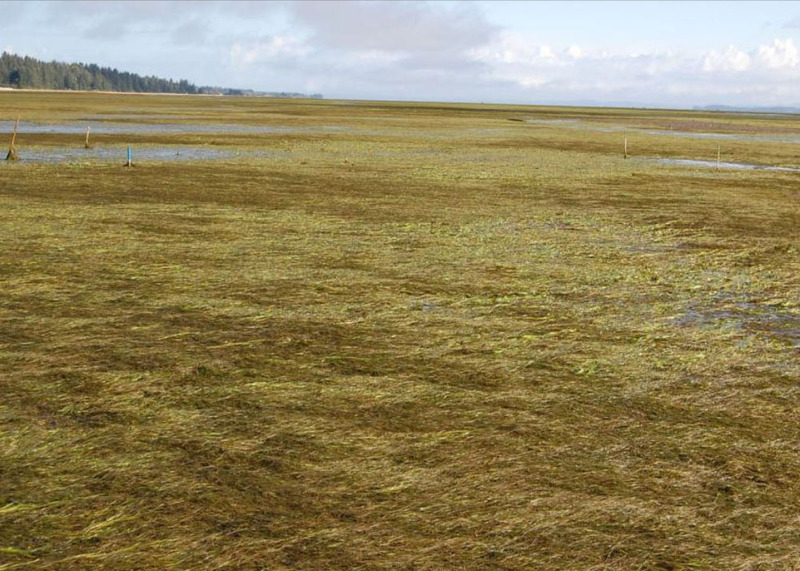 cordgrass becoming established in Oregon. state over $3 million from 2005-07. Bay’s remaining salt marsh habitat. 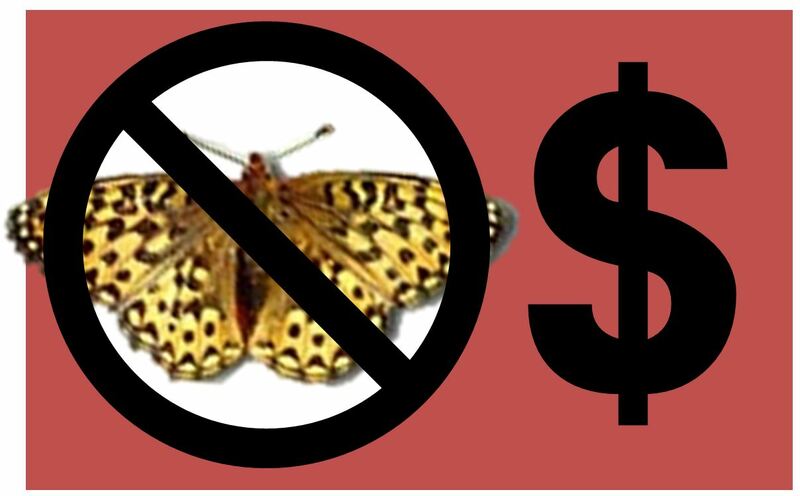 had a small (< 1 acre) population of this species (Howard et al. 2007). (Howard et al. 2007)(Figure 2). take hold (Coos Weed Board 2011)(Figure 5). 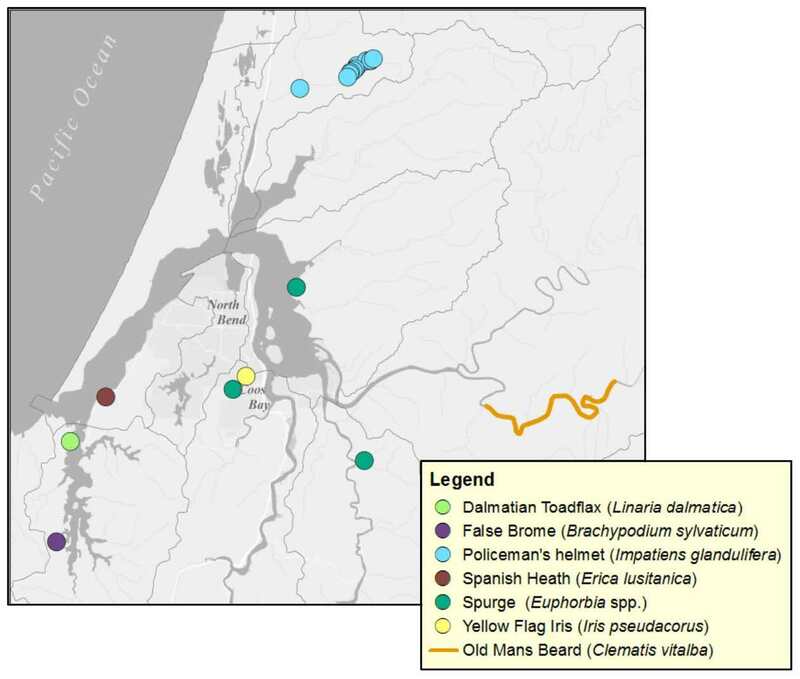 drier pasture or cropland areas (Beck 2013). acres of diffuse knapweed infesting it in 2000. Figure 7. Herb Robert (Geranium robertianum). counties (ODA 2014a; OSU 2006). (ODA 2014a; A. Brickner, pers. comm. 2015). spread exponentially in the coming years. priority for early eradication (French 2009). dropping seed-laden feces in areas with hospitable growing conditions (e.g., cotoneaster, English ivy). Table 2. Partially contained non-native and invasive vegetation species threats. * Listed species are considered noxious weeds by the state of Oregon (Oregon Department of Agriculture). 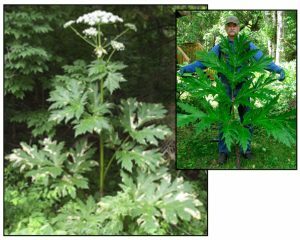 A-listed species: Economically threatening weed which occurs in small enough infestations to make eradication or containment possible; or is not known to occur in the state, but its presence in neighboring states make future occurrence in Oregon imminent. B-listed species: Economically threatening weed which is regionally abundant, but may have limited distribution in some counties; T-listed species: Weeds annually selected from A or B listed species as the focus of prevention and control by Oregon’s Noxious Weed Control Program. ** Weed distribution color key: Yellow: limited; Red: widespread; Green: historical; Gray: not known to be present. (ODA 2014a). Figure 8. Partially contained species. 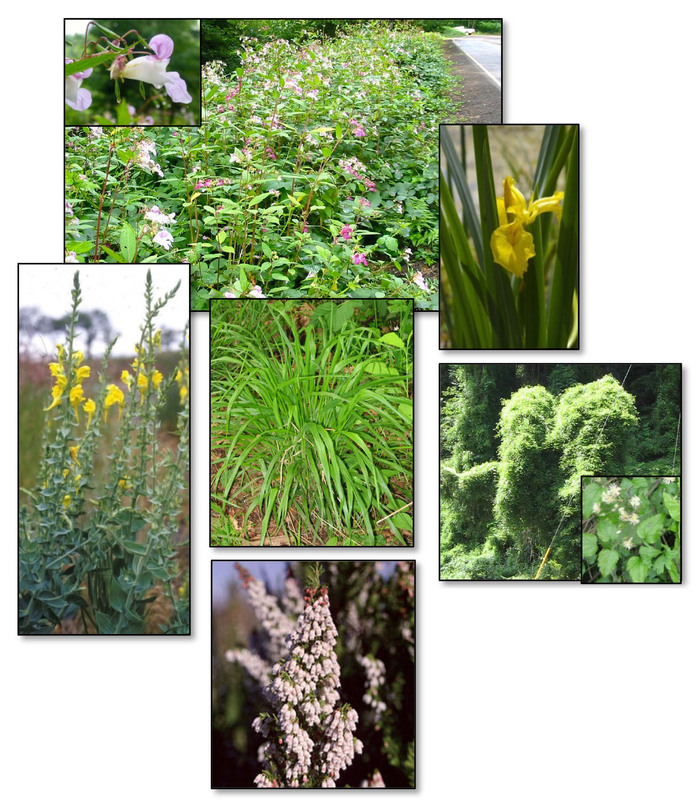 Clockwise from top: Policeman’s helmet (Impatiens glandulifera)(inset: flower); Yellow flag iris (Iris pseudacorus); Old man’s beard(Clematis vitalba)(inset: leaves and flower);Spanish heath (Erica lusitanica); Dalmatian toadflax (Linaria dalmatica). Middle: False brome grass (Brachypodium sylvaticum). Photos: ODA 2014a; Stone 2009; Lincoln county soil water conservation district; kingcounty.gov; wikipedia. spurge species are most likely leafy spurge (E.
(Figures 8 and 9)(A. Brickner, pers. comm. in the 1930s and has since spread south. Figure 9. Known locations of several weeds that are thought to be partially or fully contained. Source: A. Brickner pers. comm. 2015; EDDMapS 2014.
of this species (ODA 2014a). 2014a; CoosWA 2014a; EDDMapS 2014). 3A or triclopyr)(A. Brickner, pers. comm. in many expansively infested landscapes. were heavily infested (ODF 2014a). Table 3 (continued next page). 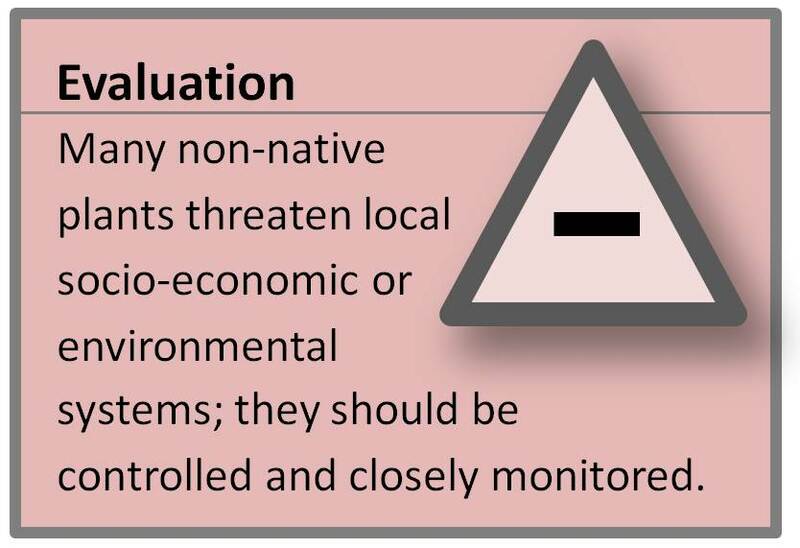 Established non-native and invasive vegetation species threats. 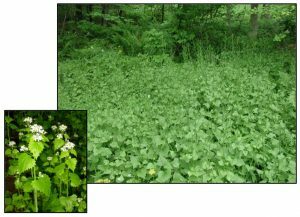 Economically threatening weed which is regionally abundant, but may have limited distribution in some counties; T-listed species: Weeds annually selected from A or B listed species as the focus of prevention and control by Oregon’s Noxious Weed Control Program. *** Non-native species not considered to be invasive. Table 3 (continued from previous page). 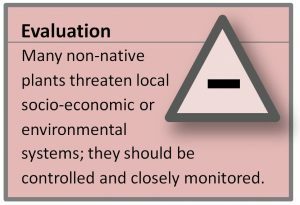 Established non-native and invasive vegetation species threats. Figure 13. Established species with widespread distribution in the project area that pose the greatest threats to the project area. 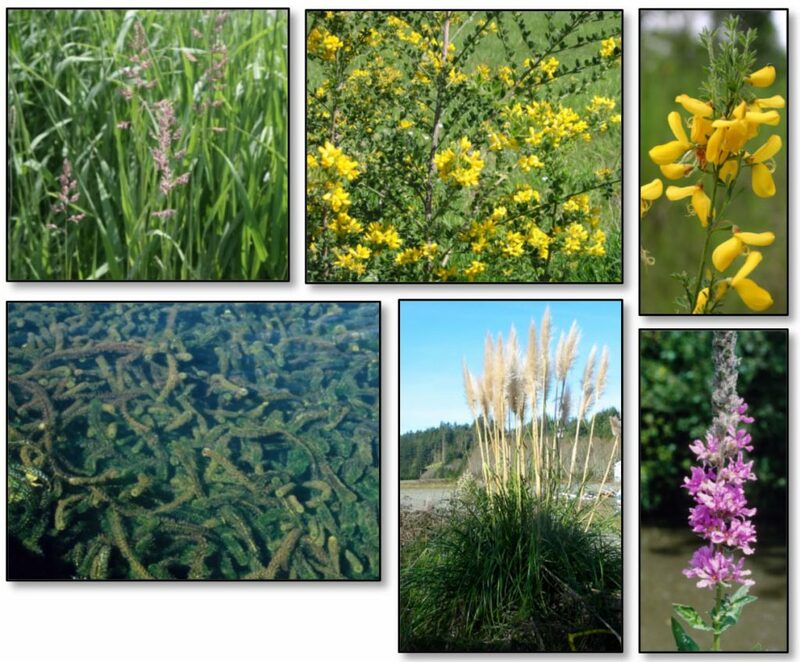 Top row: reed canary grass (Phalaris arundinacea);French broom (Genista monspessulana); Scotch broom (Cytisus scoparius); Middle row: Brazilian waterweed (Egeria densa); jubata grass (Cortaderia jubata); purple loosestrife (Lythrum salicaria). 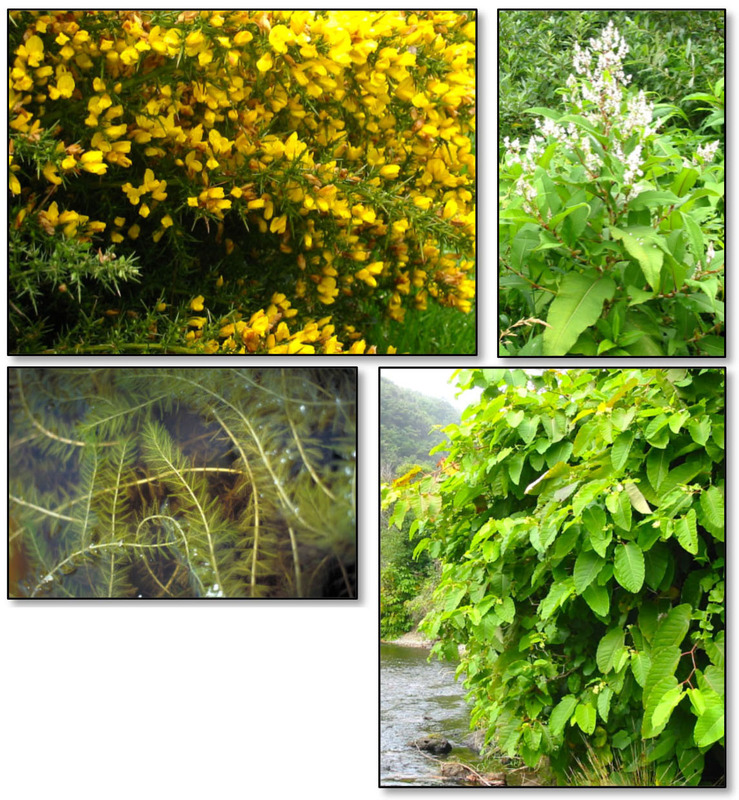 Photos: ODA 2014a; U of FL (Brazilian waterweed); and OSU (reed canary grass). especially in western Oregon (ODA 2014a). from 12 acres to three (Cornu et al. 2012). Slough (Figures 13 and 14)(CoosWA 2014b). Butterfly bush (Buddleja davidii, formerly B.
estuary in the mid-1970’s in South Slough. over nine years (Young et al. 2008). Fennel is considered only moderately invasive. coastal southern Oregon (NPSO 2008). grass, Elymus mollis (a.k.a. Leymus mollis). 10)(Julian 2012, Kaye 2004, Kalt 2008, Russo et al. 1988). stabilization (Cooper 1958; Crook 1979). hastening a natural cyclical process. Butterfly bush (Buddleja davidii formerly B.
can form new plants (OSU 2006). information is provided by Howard et al. 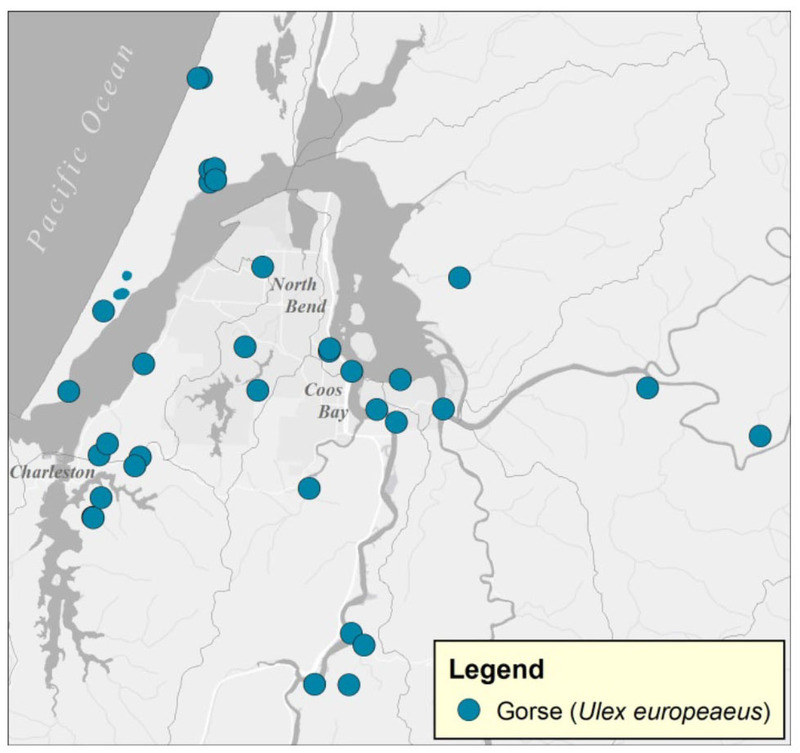 a hybrid between the European cordgrass (S.
invasion have not been documented locally. species was reed canary grass (93% of sites). and in the upper South Slough estuary (C.
pose threats in the future:C. franchetii , C.
C. divaricatus, C. nitens (Lane County); C.
See “Beachgrasses” on the right. thick carpets in wet meadows (Burrill 1996). native vegetation (DiTomaso et al. 2013). estimated at over $250,000 per year. See ‘Knapweeds and Starthistle’ below. all native vegetation in its path (ODA 2014a). 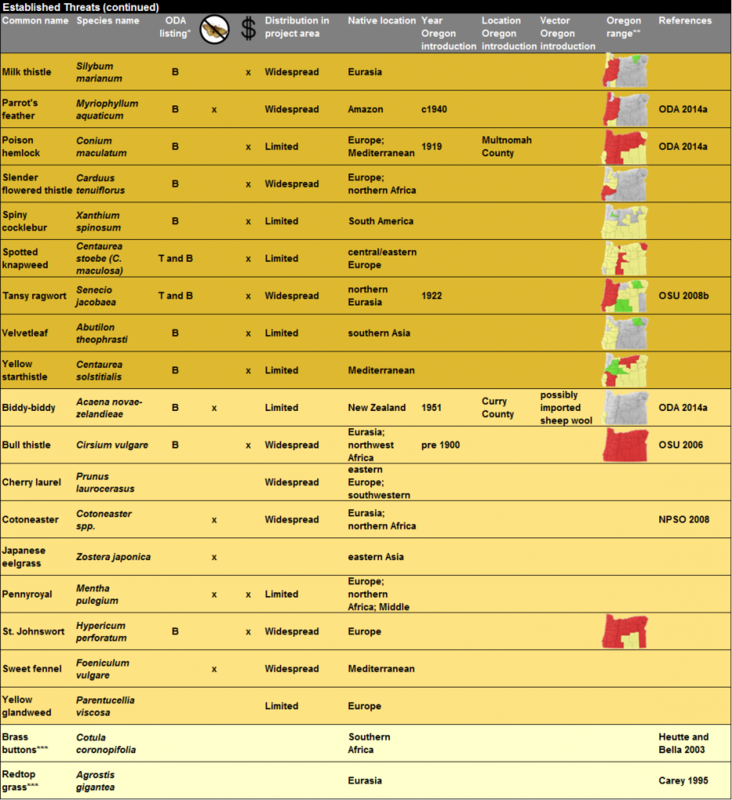 late successional forests (Waggy 2010). escaped into Oregon’s landscape (Figure 8). parent shrub (Bossard 2000, Zouhar 2005b). Unlike its native relative, cow parsnip (H.
over $1 million per year (ODA 2014b). cm) in diameter (Figure 5)(Page et al. 2006). 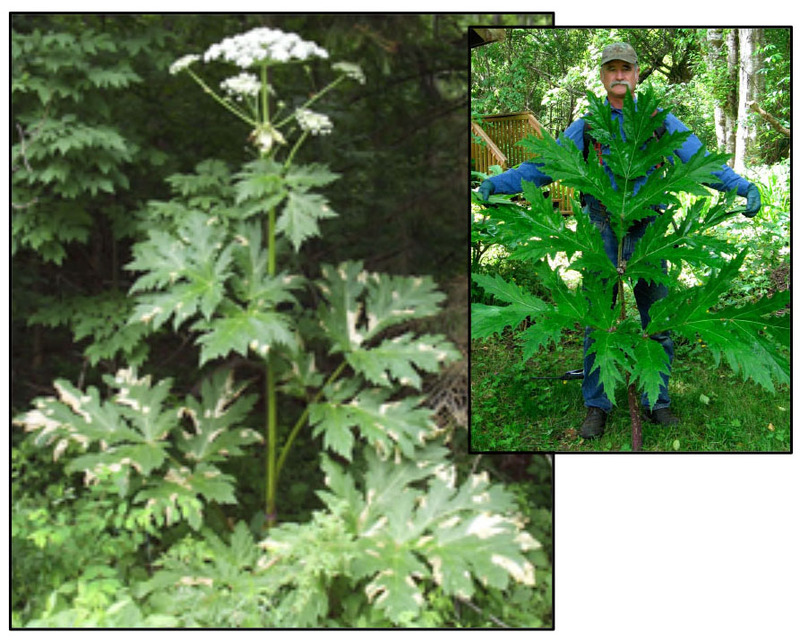 produce 1,500 seeds), giant hogweed easily outcompetes native species (USFS 2005d). flower in three years and then die. canary grass. In a study by Spyreas et al. reed canary grass populations increased. by being shaded by willow plantings. (damage to the seed coat) in order to allow water to penetrate and the seed to germinate. to release dormancy are not yet understood. (e.g., from mowing or fire)(Zouhar 2005a). soil for up to 10 years (Marriott et al. 2013). this invasive species (French 2009). order to disperse (DiTomaso et al. 2013). See ‘Knapweeds and Starthistle’ above. milky sap contains the toxin ingenolis (St.
(Gucker 2010, St. John and Tilley 2014). (Crompton et al. 1988, Zouhar 2004b). St.
grow to 10 ft (3 m) tall (DiTomaso et al. 2013). 15 years in the soil and still remain viable. habitat to become established (OSU 2008b). per year in control and lost productivity costs. over 50 years (USFS 2006e). productive grazing lands (French 2010). aquatic vegetation (Stone 2009; USFS 2006c). case) in order to germinate (Zouhar 2005c). cost over $205 million to control. and neutral effects on the local ecosystem. et al. 2011, Posey 1988). unvegetated estuarine mudflat (Figure 14). existing low salt marsh habitat (Fisher et al. open mud habitats (Posey 1988). adjacent unvegetated mudflats (Posey 1988). (ODA 2014a; Marriott et al. 2013). easily on the wind (Peterson and Russo 1988). rock outcrops, and agricultural pasture lands. plant to manage once established. 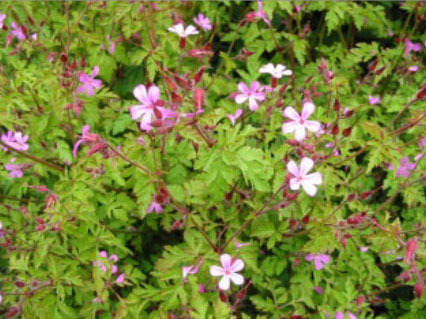 established, this plant is difficult to eradicate. over $15 million per year (ODA 2014b). Spotted knapweed (C. stoebe formerly C.
lateral shoots (Beck 2013; Zouhar 2001b). is able to live nine years (Zouhar 2001b). adversely affecting those plant communities. cuttings imperative for preventing its spread. salinity, drought, or full shade (USFS 2004). 20 cm) long (ODA 2014a). heavily infested with milk thistle. 3-7 ft (0.9-2.1 m) tall (ODA 2014a). songbirds (Munger 2002, ODA 2014a). (1.5 m) wide (USFS 2005e, Munger 2002). 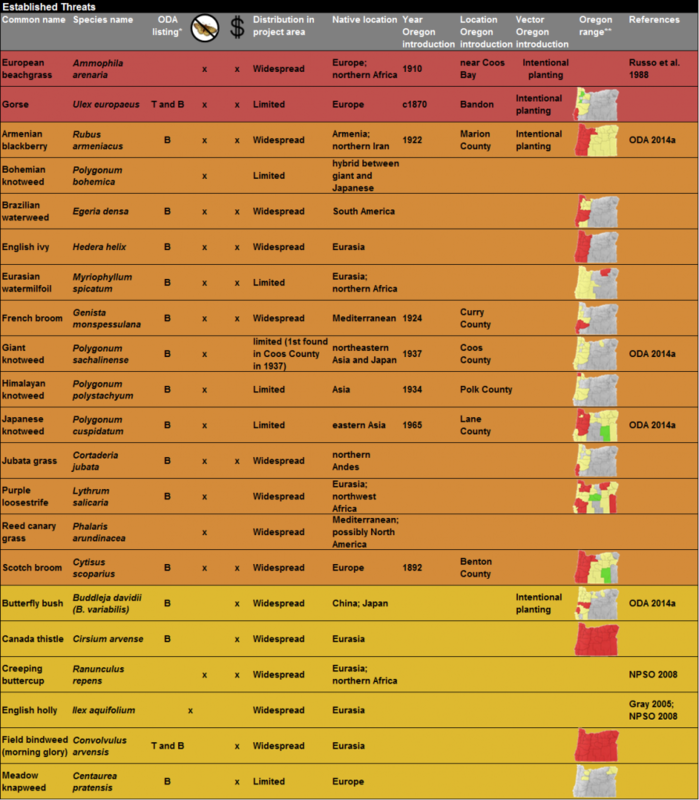 populations) and approved biological control measures (ODA 2014b). ensure they only attack purple loosestrife (A.
controlling and sometimes eradicating purple loosestrife locally and throughout the country. site (A. Brickner, pers. comm. 2015). Beck, K. G. 2013. Diffuse and Spotted Knapweed. Viewed 13 March 2015: http://www.ext. University of California Press: 203-208. California Invasive Plant Council (Cal-IPC). n.d.
Callihan, R. H., T. S. Prather, and F. E.
(Centaurea solstitialis) Achenes in Soil”. Weed Technology. 7 (1): 33-35. L. Weed Research. 25(4): 259-266. Effects Information System, [Online]. U.S.
of the Pacific Coast. Madroño 18(8): 250-251. R. Rimler, B. Joyce, F. Reasor, T. Pedersen, E.
Wright, R. Namitz, J. Bragg, and B. Tanner. Service. Viewed 16 March 2015: http://extension. of California and Other Western States. Univ. California, DANR. Publ. #3488, 1808 pp. DiTomaso, J. M., G. B. Kyser, S. R. Oneto, R.
G. Wilson, S. B. Orloff, L. W. Anderson, S.
D. Wright, J. A. Roncoroni, T. L. Miller, T. S.
Prather, C. Ransom, K. G. Beck, C. Duncan, K.
in Natural Areas in the Western United States. of California, Davis, CA. 544 pp. Thesis. Oregon State University, Corvallis, OR. 2001 March 15-16; Coeur d’Alene, ID. Health. Viewed 13 March 2015: http://www. case study in Tillamook Bay, Oregon, USA”. Thistle Carthamus lanatus, C. baeticus 2010. Inventory of Western Oregon Forests.” U.S.
General Technical Report. NC 252:11-16. Gucker, C. L. 2009. ‘Heracleum mantegazzianum’. In: Fire Effects Information System, [Online]. their Colonization, Spread, and Impact”. Holmes, S. E., B. A. Roy, J. P. Reed, and B. R.
Plan. Portland State University, Portland, ORn. wildlife area, Seattle, Washington, USA”. (M.S.) – University of Oregon. in Two Northern California Coastal Dune Systems. Kim, K. D., K. Ewing, and D. E. Giblin. 2006.
and Forestry. 71 p. Thesis. Conditions”. Wetlands Ecology and Management. Marriott, M., R. Tertes, and C. Strong. 2013.
fishery Yaquina Bay Oregon Summary Report. of Fish and Wildlife, Newport, Oregon. Mulhouse, J. M. and S. M. Galatowitsch. post-reflooding. Plant Ecology, 169, 143–159. Fire Effects Information System, [Online]. U.S. Native Plant Society of Oregon (NPSO). 2008. 2014a. 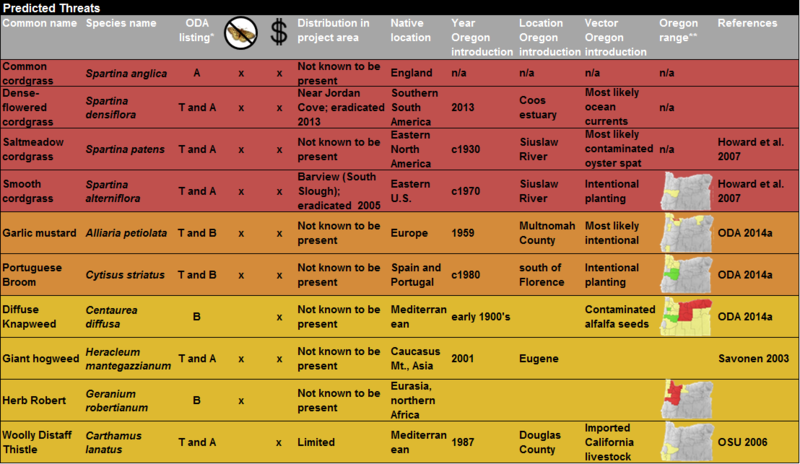 Oregon Noxious Weed Profiles. Viewed 13 March 2015: http://www.oregon. Oregon Department of Forestry (ODF). 2014a. viewed 10 March 2015: http://www.oregon. Page, N. A., R. E. Wall, S. J. Darbyshire, and G.
journal of plant science 86(2): 569-589. Stewardship Abstract for Cortaderia jubata. The Nature Conservancy, Arlington, Virginia. California”. CalEPPC News. 8: 11. WA: Lone Pine Publishing. 526 pp. Ranwell, D. 1959. Newborough Warren, Anglesey. habitat. Journal of Ecology. 47:571-601. Russo, M., A. Pickart, L. Morse, and R. Young. Sampson, A. W. and K. W. Parker. 1930. St.
Schooler, S. S., P. B. McEvoy, and E. M.
on plant diversity of wetland communities”. Diversity and Distributions. 12 (4): 351-363. Shafer, D. J., J. E. Kaldy, T. D. Sherman, and K.
Jordan Cove Energy. 56 pp. Plan. Siuslaw National Forest, Corvallis, OR. Reserve (SSNERR). 2013. 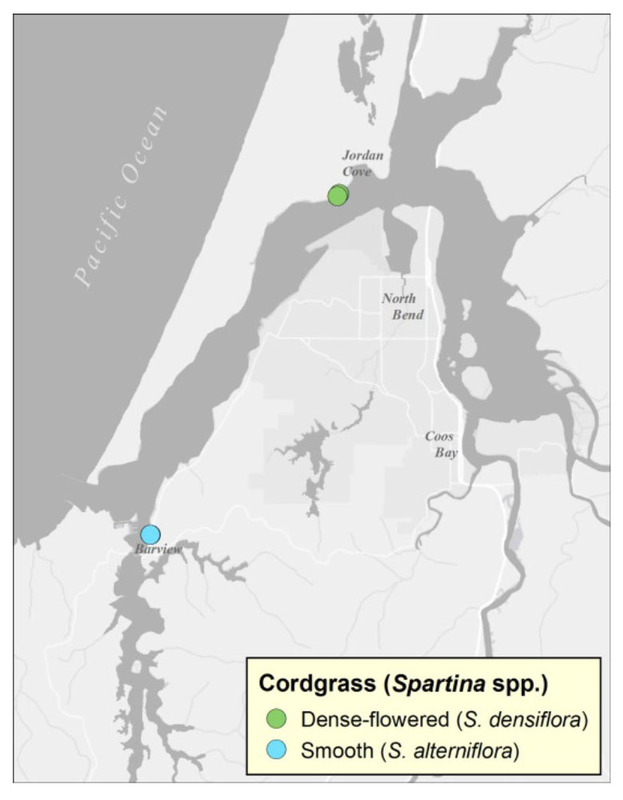 [Coos Spartina locations]. 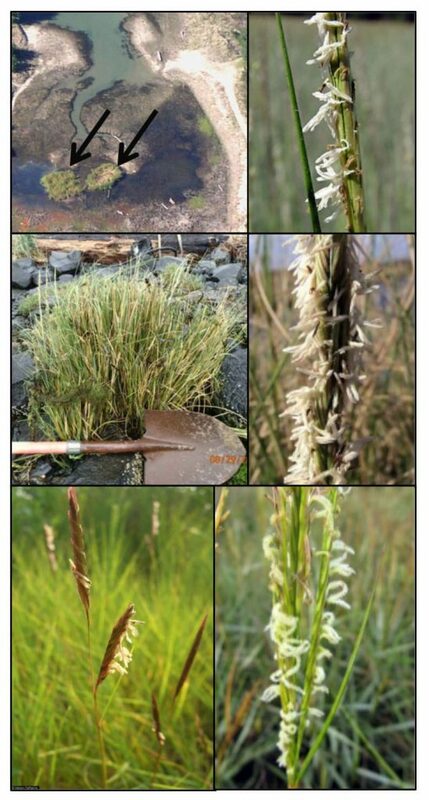 Spyreas, G., B. W. Wilm, A. E. Plocher, D. M.
Ketzner, J. W. Matthews, J. L. Ellis, and E. J.
invasion by reed canary grass (Phalaris arundinacea)”. fight forest fire with fireproof underbrush. Forests and People. 7(3): 17, 46-47. Tisdale, E. W., M. Hironaka, and W. L. Pringle. perforatum”. Ecology. 40 (1): 54-62. United States Forest Service (USFS). 2004. Weed of the Week: Japanese Knotweed. Viewed 23 March 2015: http://www.invasive. United States Forest Service(USFS). 2005a. United States Forest Service (USFS). 2005b. United States Forest Service(USFS). 2005c. United States Forest Service (USFS). 2005d. United States Forest Service (USFS). 2005e. Weed of the Week: Purple Loosestrife. United States Forest Service (USFS). 2006a. United States Forest Service (USFS). 2006b. United States Forest Service (USFS). 2006c. United States Forest Service (USFS). 2006d. Weed of the Week: Spotted Knapweed. 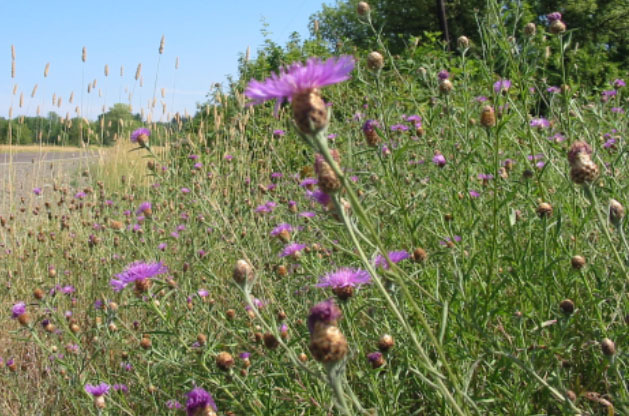 Viewed 23 March 2015: http://www.invasive.org/weedcd/pdfs/wow/spotted-knapweed. United States Forest Service (USFS). 2006e. United States Forest Service (USFS). 2014. Young, D. R., P. J. Clinton, D. T. Specht, T. H.
Zouhar, K. 2005a. ‘Cytisus scoparius, C.
Zouhar, K. 2005b. ‘Genista monspessulana’.